MB10s slimming machine uses vacuum technology, in accordance with the requirements, strengthing the skin and body fat with the reasonable movement. Radio frequency produces heat when the tissue’s electrical resistance converts the electric current to thermal energy deeper within the dermis, using the heat for fat soluble. Cavitation is noninvasive body remodeling meant to remove cellulite and inveterate fat deposits on one’s abdomen, buttocks, upper arms and legs. The benefits of no downtime, no side effects and little or no pain have led to a high acceptance of the procedure. Combining these three functions, we can get better results of slimming, body reshaping. Vacuum plus specially designed liposuction leads RF penetration to be even 5-15mm. At the same time, Vacuum mechanical tissue manipulation nips and stretches fibrillar connective tissue, effectively breaks down subcutaneous fat as well as extruded capillary vessel, Increase lymphatic drainage, promotes metabolism and reduces or shrinks the size of the actual fat chamber and greatly improved body contouring effect. The technology that vacuum folds skin makes RF energy penetrate a specific folded skin, greatly improve effect and safety. 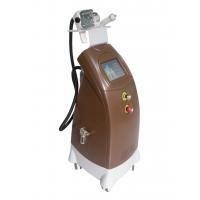 Ultrasonic cavitation in aesthetic is one of the new methods and is among the most effective. The fat trapped is liquefied with this technique, using physical phenomenon know as cavitation. Cavitation in cosmetic uses it against cellulite and fat that when liquid is then expelled through the urinary ways and with the application of lymphatic drainage and a drainage massage. Remove wrinkle on the face Look-up wrinkle, glabellum wrinkle, crow's-feet, channel wrinkle around the nose and the lips, wrinkles at the former ears, down eyelid wrinkle, neck wrinkle. Shape the body Arm, thigh, abdomen, promote and tight the waist, improve the orange-peel like tissue on the body. 4. Specifically for treating different body and face part.